Have you been told that you (or a loved one) have Atrial Fibrillation? Are you looking for unbiased, up-to-date information about Atrial Fibrillation? From someone not associated with a specific treatment or device manufacturer, pharmaceutical company, HMO, or medical insurance provider? ♥ Do you want to learn about all your A-Fib treatment options? ♥ Do you need help in finding the right doctor for you? ♥ Are you looking for hope and support from A-Fib patients who are now A-Fib free? 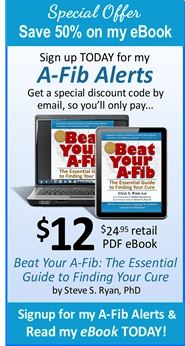 ♥ Do you want to cure your A-Fib, not just manage it? If you said yes to any of these questions, Atrial Fibrillation: Resources for Patients is the right resource for you! 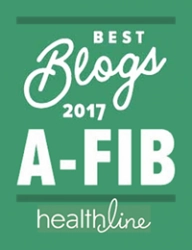 Written by a former A-Fib patient, A-Fib.com is for the non-medical reader and is written from a patient’s point of view. 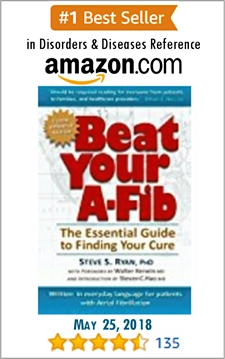 The author, Steve Ryan, is not a medical doctor but has first-hand experience with A-Fib and was cured in April, 1998, with a procedure called Pulmonary Vein Ablation. We try as much as possible to translate medical terms and scientific research into everyday language. All information is timely and based on current research, medical studies, and best practices. All reference sources are cited in footnotes and listed in the Bibliography. Are you newly diagnosed with A-Fib? Newly diagnosed A-Fib readers should start with our Overview of Atrial Fibrillation. It introduces you to all the main topics of this website. Or a more informed reader? Explore this website in any order. Check out our Treatments section covering drug therapies, cardioversion, catheter ablations, surgery and more. Read about the importance of Finding the Right Doctor and about our resources to help locate Doctors and Facilities in your geographic area. Check out our online sources and other recommendations in our Resources and Links section. Browse our A-Fib Video Library for Intermediate Level video clips. 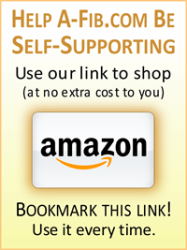 You may also want to look through Steve’s Shopping Guides when buying DIY heart rate monitors, mineral supplements and A-Fib reference books. Or search for any term or phrase with our Search sidebar feature in the upper right corner of every page. The results will display on a new page with snippets and links. Want encouragement from other patients? For inspiration, read a few of the Personal A-Fib Stories and experiences written by patients who have had Atrial Fibrillation who are now living active lives free of the burden of A-Fib. Stories are sorted into categories and topic. For one-on-one support from other patients, check out our A-Fib Support Volunteers and our A-Fib Positive Thoughts/Prayer Group. Looking for recent developments in A-Fib treatments? Visit our A-Fib Video Library for short clips at an Advanced Level. For important advances in the treatment of A-Fib, see Steve’s reports from the annual A-Fib Symposium of the world’s leading cardiologists, electrophysiologists and researchers. Under our A-Fib Research and Innovations section, see significant Research Studies and Scientific Findings and Technical Advancements & Innovations to learn about up-to-date research studies and emerging A-Fib treatments. See my A-Fib News Blog for short news items and recent articles added to the website. And for additional or more in-depth reading, Search for Articles by keyword or topic with the ‘Search’ box located in the upper right of every page. Participate! Help others!? Tell us your Personal A-Fib story and share your ‘lessons learned, or join our A-Fib Support Volunteers or our A-Fib Positive Thoughts/Prayer group. Other A-Fib patients and their families can benefit from your advice and knowing they are not alone in their battle with Atrial Fibrillation. Visit our Participate page to learn more about ways to contribute to A-Fib.com. Do you have a question that’s not answered by our Frequently Asked Questions (FAQs) or not covered by this website? Or have a suggestion? Or a comment? Contact Us by email. We look forward to hearing from you. 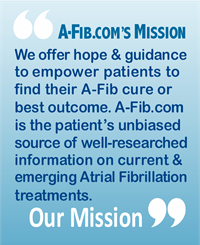 A-Fib.com is your independent source of unbiased information about Atrial Fibrillation, its resources and treatments. We need you. Contribute or donate to help our A-Fib.com website become self-sustaining! 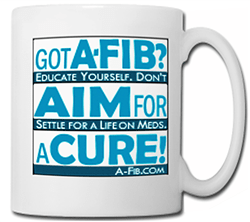 Keep A-Fib.com independent and ad-free. Learn how you can help on our Participate page. Privacy Statement: At A-Fib.com we do not share, lend, barter, or sell any information you provide when you contact us. Disclaimer: The publishers of A-Fib.com are not medical doctors and are not affiliated with any medical school or organization. The information on this site is not intended nor implied to be a substitute for professional medical advice. Always seek the advice of your physician or other qualified health professional prior to starting any new treatment or with any questions you may have regarding a medical condition. Nothing contained in this service is intended to be for medical diagnosis or treatment.